'Don't worry about genius and don't worry about not being clever. Trust rather to hard work, perseverance, and determination. The best motto for a long march is "Don't grumble. Plug on." You hold your future in your own hands. Never waver in this belief. Don't swagger. The boy who swaggers - like the man who swaggers - has little else that he can do. He is a cheap-Jack crying his own paltry wares. It is the empty tin that rattles most. Be honest. Be loyal. Be kind. Remember that the hardest thing to acquire is the faculty of being unselfish. As a quality it is one of the finest attributes of manliness. 'Love the sea, the ringing beach and the open downs. From an unused postcard. 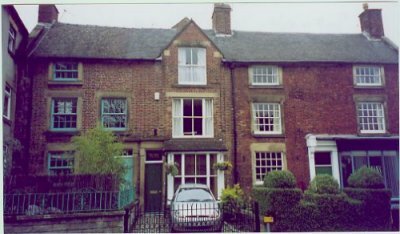 The house is on Coldwell Street, Wirksworth. between numbers 19 and 23. 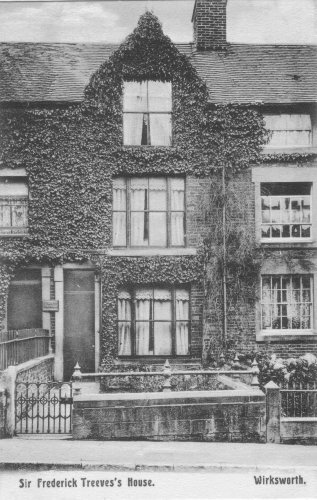 Today it is called just "Treves House", and has lost its ivy and garden wall. A high-resolution scan shows an "A T Green, Dental Surgeon" worked at this house when the photo was taken. 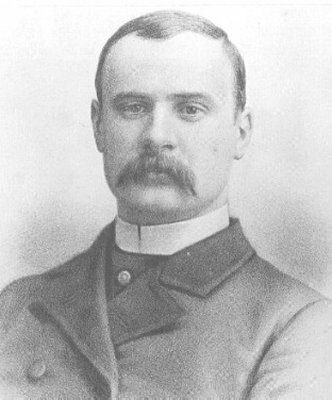 Sir Frederick Treves 1853-1923 was born in Dorset and died in Switzerland. He was Surgeon Royal, and operated on King Edward VII and the "Elephant Man". He wrote "Highways and Byways of Dorset". The full and fascinating story of Sir Frederick is told in an article by Peter Seddon. Treves House is in Coldwell Street, the street on which the Station stands. Turn right at the Red Lion as if you were going to the Station, pass the Red Lion, the Vaults and May's tea shop and Treve's House is the next but one house i.e. next to Ian's hairdresser's on the corner with North End. What a marvellous site you have put together, which has helped with my Peel connections no end. 1) Treves's first daughter, Enid Margery Treves, was born in Wirksworth in 1878. 2) In his book of semi autobiographical short stories - 'The Elephant Man and Other Reminiscences' - there is one set in 'a small northern town with its own cottage hospital' - about a doctor who had just got married etc etc - although Wirksworth is not mentioned by name, the story evidently refers to Treves's time there. In fact, many of the stories are about 'a young medical man who had started practice in a humble country town'....all drawing on his Wirksworth experience. Photo 186 - Treves House, Coldwell Street , Wirksworth. As you request any relevant info regarding this photo, I wondered whether the following details might be of interest to you? You have two photos of this family 's hardware stall on your site. The 2003 photo was taken for me by my researcher in Wirksworth, Kate Henderson. She also provided me with the details regarding the wills. The census details are from you.